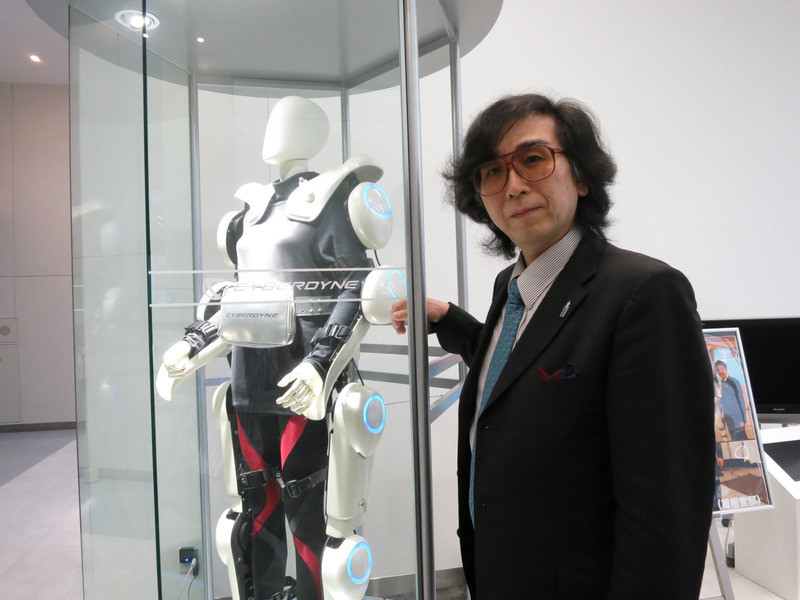 Robotics engineer Yoshiyuki Sankai, 56, has been driven by his passion for innovative technology for about half a century. 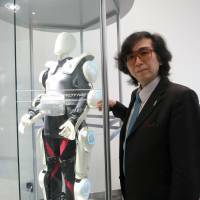 “Since my childhood, I’ve been thinking about how technology can be applied to people and society to help them,” said Sankai, CEO of Ibaraki-based Cyberdyne Inc.
Sankai turned his passion into reality with HAL, a robotic suit that helps the disabled and elderly walk and that has been spreading globally over the years. Having built pretty much everything from scratch — including the market and the industry itself — Sankai is preparing to commercially launch the Hybrid Assistive Limb and its variants in the near future. While some might think such a technology is the stuff of movies and books, HAL is already in practical use as a recognized medical device in Europe. “Humans’ physical functions get weaker as they age or experience sickness or injuries. How to support the weakened or paralyzed physical functions or improve them is a significant issue,” said Sankai, a professor at the University of Tsukuba, in an interview last month. When a person moves a limb, the brain sends bioelectric signals through the spinal cord to the specific muscles that control it. HAL functions by detecting and interpreting the signals so its motors can assist the wearer in making the motions desired. This makes actions like walking, standing up, sitting down or even climbing stairs possible for those with compromised mobility. Sankai explained that the brain, nerves and muscles exchange these signals over and over through a network consisting of motor and sensory neurons, allowing a person to move naturally. But aging, sickness or injury can damage these networks, making signal transmission difficult. This can result in motor paralysis. “The robot steps in between the cerebral nerve system and the muscles to help reconstruct a network loop (for the signals),” Sankai said. As long as the signals are there, even if faint, HAL can pick them up, he said. Persistent use of HAL to move paralyzed limbs might allow the network between one’s nervous and musculoskeletal systems to regenerate, permitting use of the leg, Sankai said. When it comes to proving HAL’s effectiveness, Sankai said it has been confirmed in a number of cases. He mentioned one woman who twice suffered a stroke. In 2011, the doctor said she would never be able to walk again, but after a two-month training session with HAL, she recovered enough to be able to walk with the aid of a cane. 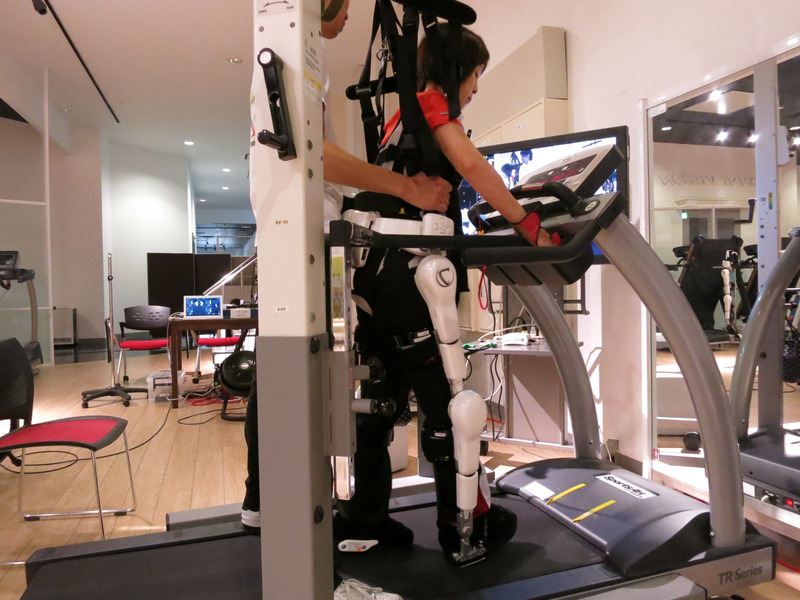 In Japan, Cyberdyne rents HAL suits to hospitals and care facilities. It also offers training courses to help people familiarize themselves with the high-tech machine. Mieko Kawakami, 69, was left paralyzed on the left side of her body after undergoing surgery for bleeding in the brain. 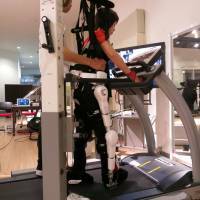 She has been coming to Cyberdyne’s facility in Ibaraki each week for three years to practice walking with HAL. “I couldn’t bend my leg when I first started. But I can now,” she said. Kawakami is still basically confined to a wheelchair and needs a brace to walk, but she said her leg has shown signs of improvement, apparently thanks to HAL. At one recent training session, she donned the suit and walked around the facility under the supervision of two trainers. “I didn’t think I would be able to walk this much,” she said. Cyberdyne will apply for HAL to be licensed as a medical device by the Pharmaceuticals and Medical Devices Agency this winter, Sankai said. Cyberdyne went public on the TSE’s Mothers’ market in March, taking another step in Sankai’s quest to spread his robotics technology to people in need. Sankai said he made up his mind to become a scientist when he was still a child, noting he was curious about science even in kindergarten. “I was really wondering why humans could move their hands as they like,” he said. It was after he earned his doctorate in engineering from the University of Tsukuba, where he studied artificial organs in 1987 that he started toying around with the idea of powered suits. He began forming the basic principles of HAL in 1991 and built the first prototype in 1997. He then founded Cyberdyne in 2004 to promote the suit through solutions-based businesses. Although a company named Cyberdyne and a sophisticated computer named HAL play ominous roles in the hallowed science-fiction films “The Terminator” (1984) and “2001: A Space Odyssey” (1968), Sankai publicly insists the naming of his company and suit are merely a coincidence. According to a Cyberdyne spokesperson, Sankai’s aim is to keep the human race alive and well with his creations. In an article written by Robot Watch, an online media outlet that interviewed Sankai along with Joseph McGinty “McG” Nichol, director of the 2009 film “Terminator Salvation,” the professor settled for the name Cyberdyne by combining “cybernics,” an academic field he created, with dyne, a unit of force that has since been supplanted by the newton under the International System of Units (SI). Currently, Cyberdyne is in the red. It racked up ¥682 million in losses on ¥456 million in sales in fiscal 2013. The firm expects sales to double and losses to halved in fiscal 2014, before breaking even in fiscal 2015. Other than HAL, Cyberdyne also provides cleaning robots for building maintenance. Sankai, who founded the company despite lacking a business background, said he first thought about teaming up with big, powerful corporations to spread HAL. “Of course, I visited large firms. I think I talked to nearly half of Japan’s top 20 firms. Presidents and management teams really praised my work,” he said. But they were only interested in HAL mostly from a research perspective rather than a potential business, he said. This eventually clarified the solo path he had to take. “No market, no users, no professionals, no industry and no international rules, everything was no, and innovative technology often faces this situation,” he said. This is why Sankai founded Cyberdyne and why he is trying to overcome the many daunting hurdles himself without giving up. “One reason why I can keep going is simple. If this had been a project handed to me by someone else, I’m not sure I could have done it, but this is something that comes from within me,” he said. This section, appearing on the second Monday of each month, features new technologies that are still under research and development but expected to hit the market in coming years.